The long reach of the Sennebogen 830 M-T and the 360-degree swing capability and grapple rotation lets operators position their machine where it minimizes the movement and maximizes the productivity. Earle Fawcett knew that he had squeezed everything he could out of his aged knuckleboom loaders. It was time to move on. "When you've made mill upgrades and you're putting money into your operation, but you're trying to feed it with some old equipment that's almost impossible to find parts for anymore, you have to say, look, we can't just keep running that way." Fawcett wears a few hats at the Plaster Rock Lumber Mill operated by Twin Rivers Paper Company near Edmundston, New Brunswick. His duties include steam plant chief, mobile equipment manager and environmental coordinator. The issue of sourcing parts to keep his loader fleet running is ingrained in everything he does. He explained that the mill had a purpose-built material handler in the yard, too, for a few years, but found that timely access to service parts was a problem with that machine, too. 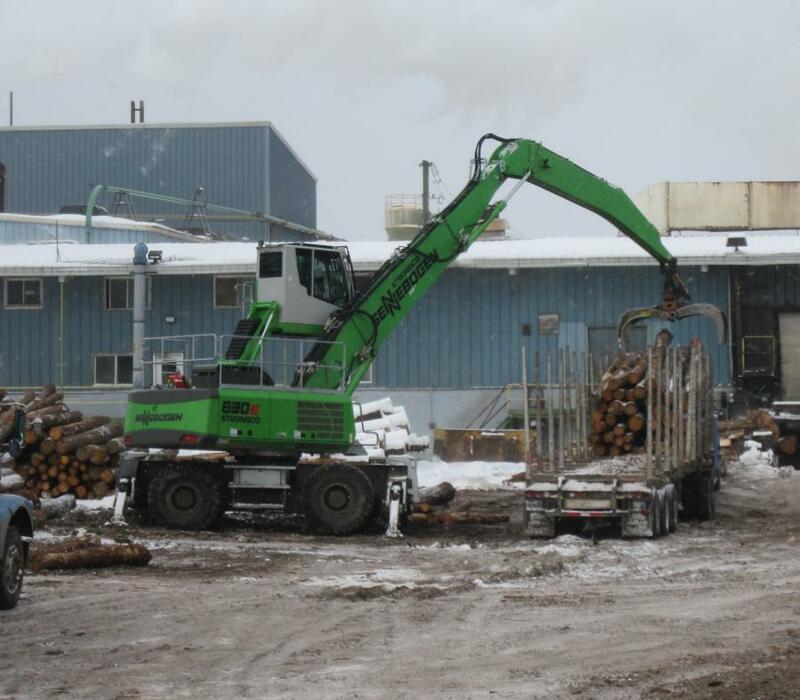 Fawcett brought up the need for new log-loading equipment with Strongco, the local Sennebogen dealer. Strongco introduced Fawcett to some of the maintenance crews servicing Sennebogen machines in other nearby yards. "We visited two mills in the Bathurst area," Fawcett said. "I watched the Sennebogens work and the maintenance people told me they were trouble-free machines and that the parts were easy to source. We were on our way to a third yard when I decided I'd seen enough — let's go back and sign up the paperwork." Sennebogen has made access to parts a strategic aspect of its engineering. Known for the unique expertise in hydraulic systems for crane and material handlers, the engineering team is tasked to minimize the number of proprietary parts in their design. They specify standard off-the-shelf parts wherever possible. This way customers can find what they need when doing routine hydraulic and electrical service from any nearby industrial supply house. Sennebogen also ensures that its distributors maintain extensive service inventories in all their branches, while the central warehouse at Sennebogen headquarters in Stanley, N.C., is well stocked with every component for any green machine in the field. Handling the volume of 9 ft. stud wood was a new line of production for the mill, and this was a key driver for upgrading the loading equipment. Fawcett said the 830 M-T easily replaced the older material handler, and looks to boosting throughput further when its new 9910 Rotobec grapple arrives. The high cab gives the operator the best view of the work environment. "The operators are very happy with the 830," he said. "It's like they stepped off a dinosaur and into a Cadillac." 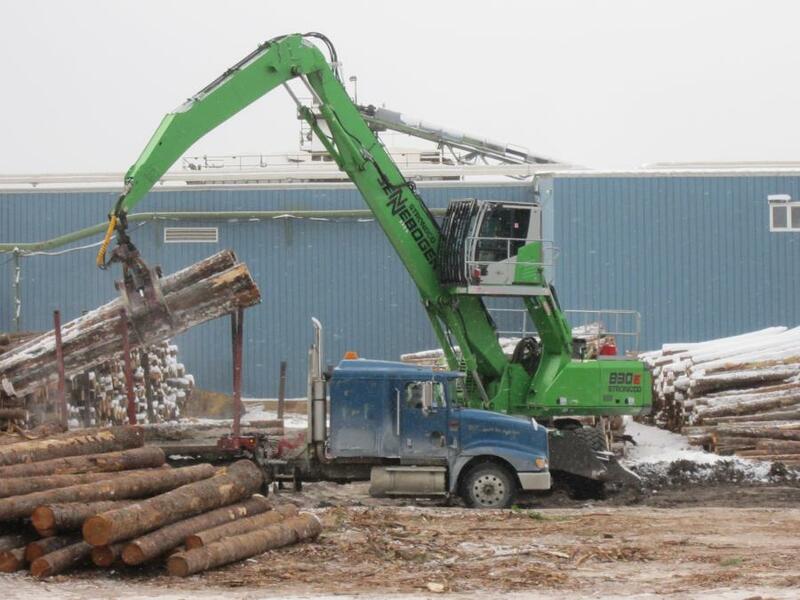 The M-T model of the 830 is specially designed for log yards. A standard 830 upper chassis is mounted on an undercarriage that has been designed for heavy pulling stresses, with separate transmissions on each axle for added pulling power and traction. Fawcett said that this strength will be put to use, too. Wood stacks in the mill yard have capacity for just a day and a half of production, while a reserve yard a mile up the road can store another 170,000 cu m. However, the mill yard is about to expand into an adjacent property, and a new high capacity log trailer is on-site to begin ferrying wood to the feed deck. Hauling fully loaded log trailers is a challenge in most yards. As Fawcett said, "depending on the time of year, this yard is a dust bowl or a mud pit." The trailer-pulling capability of the 830, though, will allow an increase in ready stock for the sawmill. Running double shifts 5 days a week also presents challenges for the two technicians responsible for Plaster Rock's mobile equipment. Along with their various log loaders, the fleet also includes three recently acquired front-end loaders. As Strongco customers, Fawcett and his technicians were invited to attend the Sennebogen Training Center in Stanley, N.C. The training facility provides classroom and hands-on technical instruction, without charge, at primary and advanced levels. Fawcett appreciates the simplicity of Sennebogen engineering as another timesaver. In his experience, troubleshooting other equipment means waiting for a factory tech to come with a computer. Sennebogen has simplified its machines with hydraulic controls that don't require complex electronics, so an experienced equipment tech can troubleshoot problems without the wait and without the expense of travel time. If factory support is needed, Strongco's nearest technician is just a half-hour away. Through its first four months in Plaster Rock, the Sennebogen log-loader has given little need for Fawcett to make those calls. As reported by the maintenance teams Fawcett first met in Bathurst, the 830 M-T has performed "trouble-free."